The Sports Ankle Support stabilizes your ankle during sports activities and helps protects against sprains! High quality German made ankle support brace great for a variety sports activities. Secure fit and maximum stabilization: the extremely light Sports Ankle Support features an innovative taping strap which supports the ligaments and helps protect your ankle against sprains and twisting. The ankle brace is light, breathable and durable. ✅HELPS PROTECT AGAINST SPRAINS: The Sports Ankle Support holds the ankle securely in place during sporting activities and reduces your risk of sprains and ankle injury. 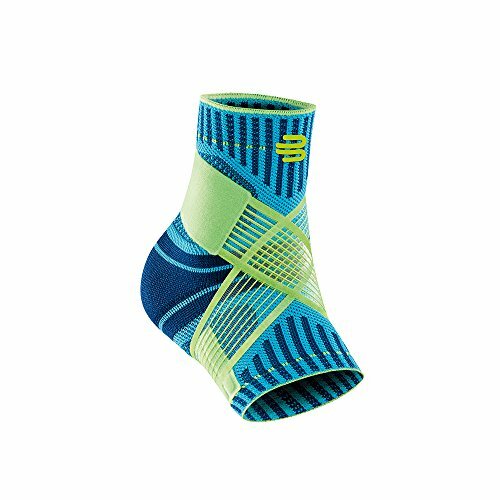 The support’s beneficial compression and integrated taping strap stabilize the ankle. The strap provides adjustable support and flexibiltiy to ensure effective stabilization and a comfortable fit. ✅TARGETED RELIEF: The knitted fabric gently massages the tissue during movement. The figure eigtht strap also exerts additional compression. This action improves circulation and the dual stimulation triggers positive sensory motor feedback. The ligaments are supported and the stabilizing muscles are activated to reduce the risk of an ankle sprain or lateral twist. ✅COMFORT AND FREEDOM OF MOVEMENT: The Air Knit fabric of the Sports Ankle Support is lightweight, comfortable, moisture-wicking and washable. It is designed for maximum breathability and comfort. Its anatomic contouring and taping strap provide a secure fit and maximum freedom of movement. ✅FIT AND SIZING: Measure the circumference of your ankle at the narrowest point above the ankle bone. Refer to the sizing chart in the product images for a size to associate with this measurement.